When you’re a beginner at the range everything is exciting. From unpacking your gun and ammo to checking your target to see how you did. It is all very new and you learn something about your shooting with every visit. But where does it go from there? All good instructors recommend further instruction, not just to enhance your skills, but because shooting is a perishable skill and you need to practice often. This can mean finding ways to keep it interesting. If you’re looking for other ways to keep up your shooting and enhance your skills outside the classroom, there is good news. There are several different competitive shooting leagues to help keep you sharp, and have fun while doing so. Shooting competitively not only gives you much needed “trigger time”, it will also introduce you to other shooters that will help improve your skills, and keep you coming back to learn more. Another great thing about competitive shooting is that there are multiple options available, to suit your particular type of gun and skill set. If you are looking to enhance your handgun skills, you have several fun options. I always recommend my students start with Steel Challenge. It’s a great baseline competition and the stages you shoot (the targets and their positions) are always the same. In Steel Challenge, the shooter stands in a box drawn on the ground and shoots at 5 steel plates while being timed. There is no running or changing shooting positions involved. You can shoot Steel Challenge with pistols or rifles. It’s a great way to dip your toe in competitive shooting. For more information check out steelchallenge.com. If you’ve nailed down Steel and you’re looking for more pistol action, you have more great options like USPSA and IDPA. USPSA is the United States Practical Shooting Association, and it involves movement and different target types and distances. You will still be timed, but the stages are much more involved, with running between shooting positions and shooting around walls and barriers. You can also shoot USPSA with a pistol or rifle, and there are different gun divisions, so that you shoot against competitors with similar equipment. You can learn all about USPSA at uspsa.org. IDPA, the International Defensive Pistol Association, is like USPSA, but the stages are designed to simulate real-world defensive scenarios and you are encouraged to shoot with your carry gun and equipment. Each stage and match will present new scenarios designed to help you train for real life potential defensive situations. They also divide shooters up by the type of gun used and by skillset, so new shooters are competing with others with similar skills and experience. If you’re interested in taking your shooting to the next level while thinking strategically, visit idpa.com to find a match near you. Once you’re really hooked on competitive shooting, take a look at 3 Gun. 3 Gun involves shooting stages with three different guns – an MSR (Modern Sporting Rifle, a rifle built on the AR style platform), a shotgun and a handgun. Stages can involve shooting with your shotgun, then safely placing your shotgun in a barrel or safe area, retrieving your rifle and shooting different targets with your rifle. Then you’ll safely store your rifle and retrieve your handgun to continue shooting even more targets. You’ll not only be able to safely transition from one gun to the next, you’ll run from one shooting position to the next. If you’re ready to check out a local 3 Gun match visit 3gunnation.com. Whether you’re a new shooter or you’ve been competing for years, be sure to also look at shooting leagues. If you’re looking for a ladies-only platform that encourages safe competitive skill building, it doesn’t get any better than A Girl & A Gun. 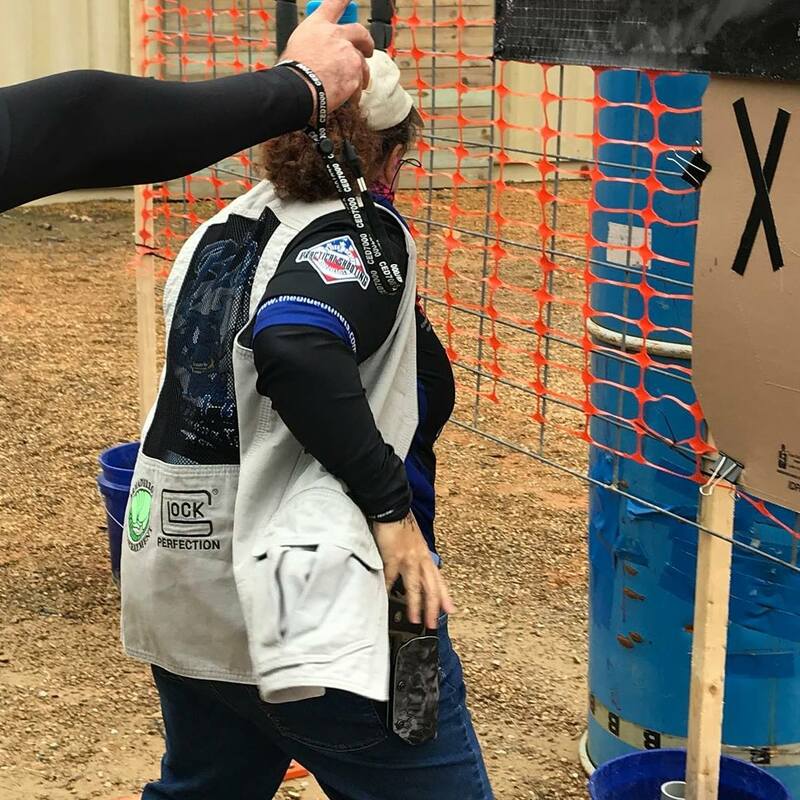 A Girl & A Gun has chapters all over the world where women get together with an instructor at local ranges to improve their skills, learn more about firearms and shooting safety, and to compete with others in a fun and safe way. A Girl & A Gun provides the opportunity to learn locally, and from nationally recognized instructors at events like the Annual Conference held every Spring, and Fall Fest where shooters and trainers get together to learn and try new sports. To find a chapter near you, visit agirlandagun.org. No matter where you are in your shooting journey, you should always be looking to improve. There’s no better way to train than to find a fun and engaging way to get new training, in a way that is rewarding and will likely keep you coming back. While competitive sports can’t replace classroom training and dry fire, it will introduce you to other skills that can only be found in situational shooting and help you build your own “shooting family” that will keep you coming back to shoot.